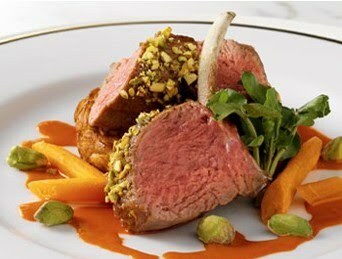 Lamb and carrots are the perfect marriage of fall flavors in this dish by Head Chef and Proprietor of 3 Michelin-starred The Inn at Little Washington, Patrick O'Connell. Place the carrot juice and ginger root in a 2- quart saucepan and simmer over medium heat, whisking occasionally, until the carrot juice is reduced to 1 cup. Remove and discard the ginger root and, over low heat, in the creme fraiche. Season with salt and white pepper. The sauce may be made in advance, stored in the refrigerator, and rewarmed before serving. Peel the potatoes, leaving them whole. Combine with the rutabaga and steam for 15 minutes. Let cool. Using the large holed blade of a box grater, shred the potatoes and rutabaga. Fold in the finely chopped onions. In a large skillet, heat half of the clarified butter over medium heat. Carefully place 3 cakes in the skillet and brown them on both sides for about 5 to 7 minutes for each side. Remove and drain on paper towels. Repeat with the remaining clarified butter and vegetable cakes. The rostis can be made up to 1 hour in advance and rewarmed before serving. Place the lamb in a roasting pan and bake for about 25 minutes. Remove the lamb, place it on the cutting board, and let it rest for 5 minutes. Lay the sharp knife against the bone and slip the meat off 2 of the racks in one piece, leaving one rack as is. Meanwhile, in a small mixing bowl, whisk the mustard and brown sugar together. Using a pastry brush, coat the meat with the mustard mixture, then roll each rack in the chopped pistachios. Return to the oven and bake for an additional 10 minutes. Remove the lamb from the oven and let rest.